By The OCPA's Brandon Dutcher! Thus far I have only discussed Staff Editorials, but I have planned on swaying from doing just that from time to time. Occasionally I will post articles and things that have been written by contributors and myself, and every now and then critique a non staff editorial. I will unquestionably do so whenever someone like Brandon Dutcher is featured. I have very little tolerance for people who rant and rave about teachers being overpayed, all the while making close to $100k/yr (see Dutcher's '07 salary, taken from The OCPA's IRS filing..it shows a strategy of "throw piles of money at think-tank employees, that will solve all our problems!") for doing little more than "tweeting" all day, writing an occasional opinion column, supporting $1/4b in taxpayer money going to Billionaires for their basketball team (shhh! Don't say that too loud while I'm at a tea party rally deal says Brandon! ), and participating occasionally in elegant dinner parties with fancy guests. Today The Oklahoman features a rant written by Dutcher (in between important "tweets" no doubt! ), entitled "‘HOPE’ is irresponsible public policy." 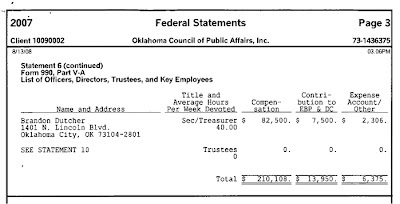 Dutcher sounds the alarm early in the column, stating "...the state’s most powerful labor union, the Oklahoma Education Association, are asking taxpayers for an additional $850 million annual bailout." and it is no mystery what he is doing here. Increased taxes AND a powerful union behind it? Yipes! That is enough to get people pretty darn riled up around here! This here should no doubt be the proverbial nail in the coffin for teachers and folks who want public education in Oklahoma to be funded on a level equal to other states in the region (which is what HOPE is, a mandate that Oklahoma schools receive funding on average equal to other states around us)... But wait! 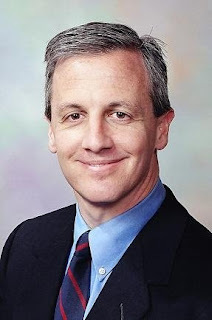 Luckily for those of us who do not approve of people like Dutcher, this is the bible-belt and those who take the bible and it's lessons seriously, do not appreciate liars and charlitans. Am I missing something, or did Dutcher just tell us via Mr. Allen that the revenues the teachers are asking for will come from other agencies, not from additional taxes? That is exactly what it looks like to me. And note the phrase "..unless the state receives a windfall in additional revenue" and note why Dutcher refers to Stimulus money as "Stimulus" in the column. Dutcher knows quite well that it is impotant to write-off this windfall in additional revenue early on so as to support his arguments later in the column. And regarding the quote from Blatt, I asked him about what Dutcher wrote and he replied:"I of course meant using the Rainy Day Fund and considering new revenue sources. At least he didn't pretend we agree.Thanks for the heads up." Yet Dutcher pretends he is talking about this matter and how rotten a thing it is. I would like to ask Brandon what they have been teaching him at the innumerable bible classes he attends, but I am pretty sure that he does not listen when he attends so why bother. Also, wasn't Dutcher one of the big guys behind TABOR a few years ago, and the real goal of TABOR was to take funding away from these agencies so that their tasks could be then taken on by the glorious private sector? It would seem to me that those agencies losing some of their funding would partially fulfill Dutchers dream scenario he has been fantasizing over for some time. But anyone who knows anything about this fellow, his number one goal is to destroy public schools. All fantasies must be pushed aside until this is done so all children can grow up and be nice think-tank employees and play on Twitter all day instead of contribute to society by working for a living. Steve, you are doing an amazing job being a watchdog on these guys. Keep it up!